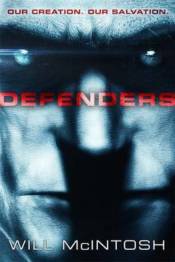 When Earth is invaded by telepathic aliens, humanity responds by creating the defenders. They are the perfect warriors - seventeen feet tall, knowing and loving nothing but war, their minds closed to the aliens. The question is, what do you do with millions of genetically engineered warriors once the war is won? Defenders is a novel of power, alliances, violence, redemption and yearning for connection - from one of the brightest new stars in science fiction.